^ Jonas Jusélius and Dage Sundholm. The aromatic pathways of porphins, chlorins and bacteriochlorins. Phys. Chem. Chem. Phys. (Open access)使用|format=需要含有|url= (帮助). 2000, 2 (10): 2145–2151. doi:10.1039/b000260g. ^ Jose R. Garabatos-Perera, Benjamin H. Rotstein, and Alison Thompson. Comparison of Benzene, Nitrobenzene, and Dinitrobenzene 2-Arylsulfenylpyrroles. J. Org. Chem. 2007, 72 (19): 7382–7385. PMID 17705533. doi:10.1021/jo070493r. ^ Armarego, Wilfred, L.F.; Chai, Christina, L.L. Purification of Laboratory Chemicals 5th. Elsevier. 2003: 346. ^ Piloty, O. Synthese von Pyrrolderivaten: Pyrrole aus Succinylobernsteinsäureester, Pyrrole aus Azinen. Chem. Ber. 1910, 43: 489. doi:10.1002/cber.19100430182. ^ Robinson, Gertrude Maud; Robinson, Robert. LIV.—A new synthesis of tetraphenylpyrrole. J. Chem. Soc. 1918, 113: 639. doi:10.1039/CT9181300639. ^ 11.0 11.1 Benjamin C. Milgram, Katrine Eskildsen, Steven M. Richter, W. Robert Scheidt, and Karl A. Scheidt. 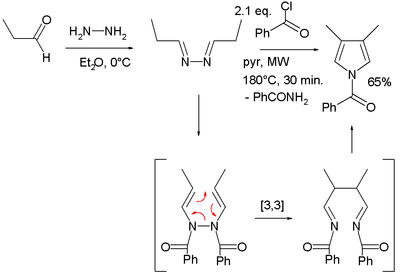 Microwave-Assisted Piloty–Robinson Synthesis of 3,4-Disubstituted Pyrroles (Note). J. Org. Chem. 2007, 72 (10): 3941–3944. PMC 1939979. PMID 17432915. doi:10.1021/jo070389.